Designing and building great landscaping websites is much like creating a perfect outdoor space. Both require incredible insight about how the space will be used. Additionally, neither landscape design decisions nor landscaping website ideas can lead to success without a keen eye for form and style. However, expertise in landscape design does not necessarily mean you can design the perfect website. 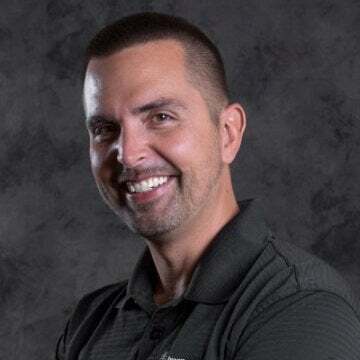 Part of the reason you’ve succeeded in the landscaping industry so far is due to the fact that you know when to step back from areas you’re not gifted at. 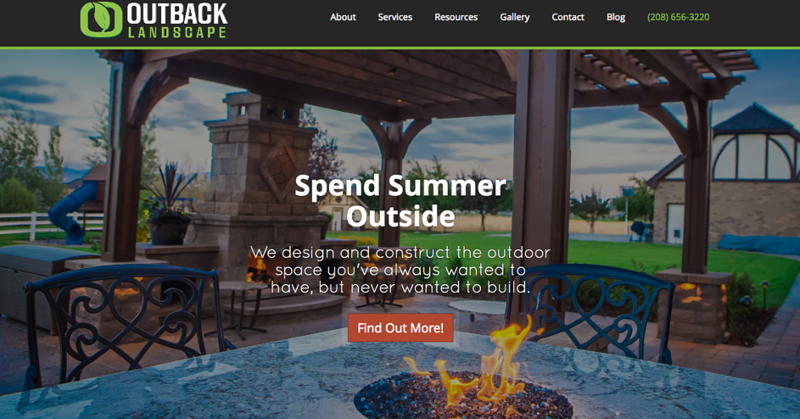 Designing a website for a landscaping company requires a great amount of time and energy and you have a business to run, sales to make, and people to manage. Making bad decisions and including the wrong landscaping website ideas (or too many of them) will lead to paying a hefty price paid for a site that is ugly, confusing, and will turn off many prospective clients. Here at Landscape Leadership, we’ve worked with many landscapers and other green industry companies. These clients have come to us with varying attitudes about their existing sites. Some face minor tweaks, but others want a fresh reboot. You may not know what makes for a great landscaping website, but just like a carefully designed property, you can feel when you’re on one within a few seconds. The homepage on your site is your landscaping company’s virtual front door, and the first place to start. You cannot include all of the suggestions we will outline, but many of them may potentially be used on your homepage. You’ll probably have to omit some if they don’t work for your particular situation. Just like in landscape design, form follows function. The user’s experience is more important than what you want to say. You can accomplish both, but the visitor experience comes first. 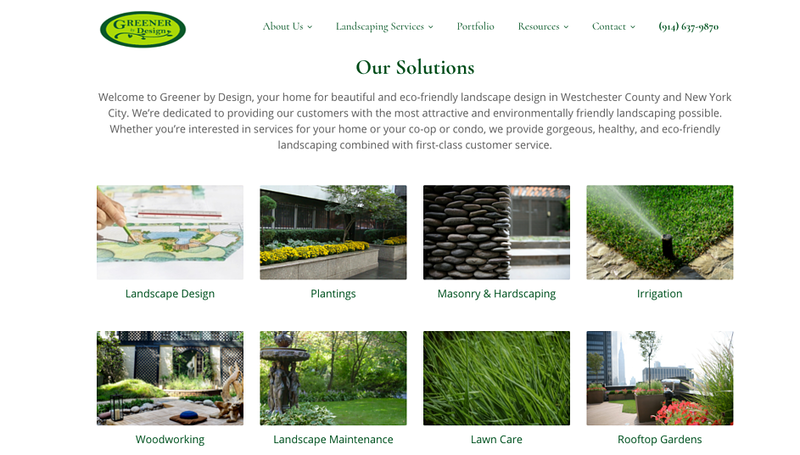 Don’t overcomplicate your landscaping website with a busy homepage. It’s not meant to accomplish every goal you have with your online presence, just be the starting point that easily leads the visitor to next steps. Understand that just like a landscape, things go out of style and need renovated eventually. With the speed in which trends can change, it’s not unheard of to redesign a website every 3 years. While you should try to incorporate most of the elements in this article on your homepage, there are some homepage elements that are absolutely critical. We’ll cover those first and then later move onto ones that you may have to make tough choices between. We will also give lots of love to our clients. They have some amazing looking homepages! Placement: For most landscaping websites, we recommend placing a simple logo in the top left or center of the page. Your website should be built on a responsive design template that fits to the window of whatever device you’re viewing it on. 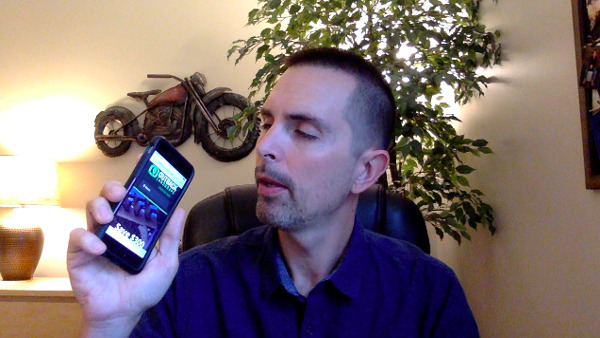 On mobile devices, your logo will adjust to be easily viewed. Here’s a great example of a clean logo at the top left on the Neave Landscaping desktop version of their website. 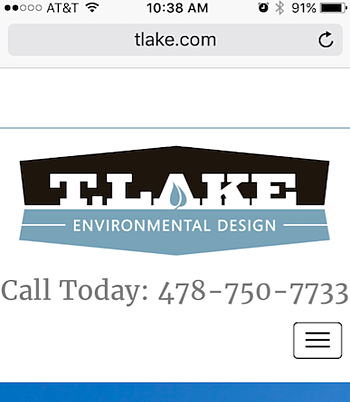 T. Lake Environmental Design also has a great option for placement. The top center evenly divides the menu items up in 2 sections. Size: Your logo should be noticeable. People need to instantly understand whose landscaping website they are on. However, your logo isn’t the focal point. It is meant to be a brief area of focus. Don’t go too big. 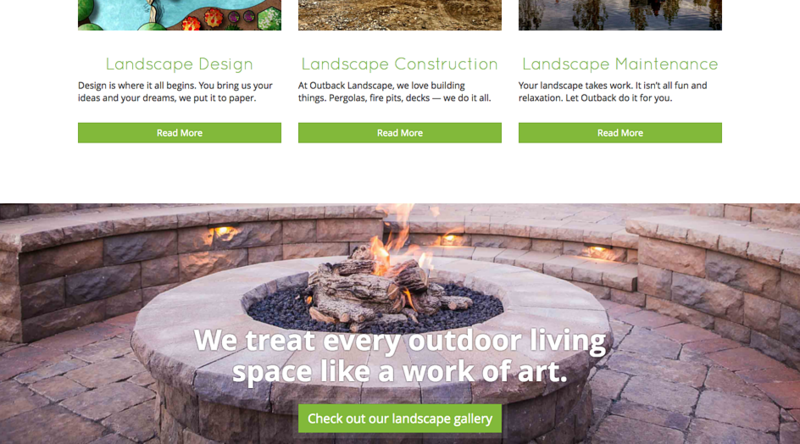 Design: Some landscaping websites look odd because the company only has one version of their logo. Have a graphic designer create slight variations in your logo in the same color combinations. You may find that one such shape or design looks more clean on the top of your homepage or that you’re overdue for some fresh branding. Keep it simple with company name and graphical elements. There’s other places for phone numbers, addresses, etc. A “hero image” is the central and prominent image you see on a homepage or other interior page of great landscaping websites. Within a split fraction of a second, the visitor should know what the page is about. Website designers often call this the “blink test”. Look at a website page and then blink your eyes shut. Do you remember what it’s about? Can you picture where the simple logo was located and a few other main homepage features? In the green industry, we have awesome opportunities to showcase our work. People love seeing images of glowing fire pits, rugged pergolas, and vivid plants and lawns. Just be careful that your image isn’t too bold. Adjusting the opacity of the image is also a good way to tone it down while getting the message across. Hero images can add visual appeal or integrate important functions to direct visitors to funnel them along to learn more. Here are some great examples on some of our clients’ homepages. They often change around these elements throughout the year, so some of these images may look differently if you visit these pages later. Reef Tropical is a great example of a landscaping website that uses the hero image as purely a visual enhancement. There’s simple text and gorgeous images that rotate to feature properties they service. 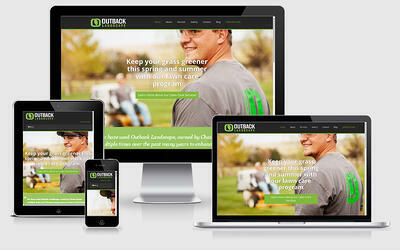 Outback Landscape in Idaho Falls uses their hero image to direct visitors to learn about specific services. Another one of the best landscaping website ideas is to change these images and CTA button to go to seasonally-relevant areas to generate leads for your sales team. T. Lake Environmental Design uses their hero image to link to specific case studies from time to time. Clicking on the text link or the thumbnail image will send the visitor to read more. Level Green Landscaping calls visitors straight to action within their hero image with a prominent Call-to-Action button (CTA) for a free consultation for Commercial Landscape Maintenance. Beyond the hero image, does the visitor know what kind of company you are, what kind of customers you cater to, and what areas you service? Creating a compelling yet concise homepage headline can accomplish this. The headline should be “above the fold” and is often contained within the hero image. This is a term that conveys what someone sees on your website before they scroll down. Think big picture. You don’t need to list every service. If you design and build outdoor spaces, you don’t need to list patios, structures, walkways, trees, shrubs, flowers, annuals, etc. Use the broad terms that communicate the larger groupings. Use descriptive language that evokes emotion, calls people to action, communicates your expertise or experience, and builds community. Greener by Design differentiates themselves by focusing on natural, healthy landscapes that last a lifetime. No Ka Oi Landscape in Kauai, Hawaii emotionally charges a visitor to want the best image possible for their commercial property by choosing the best company around. As you develop relevant content for your website, you’ll end up with dozens, if not hundreds of website pages. While the abundant amount of pages on your website is a positive factor on SEO, you should limit how many of them are easily found in your navigation menu. Keep thinking big picture. Try to keep options to a minimum. At first glance, the visitor should be able to see approximately 4-7 menu items that are clearly descriptive in a word or two. Prospective customers poking around your website should see more choices when hovering or clicking on these primary menu choices as they expand. This will allow them to go to particular areas of interest. They may see “Landscape Design” and hover to expand options leading them to “Ponds & Fountains”, all the while seeing other broad service options you provide. Regardless of how your menus are structured, be sure visitors can easily find them no matter where they are. Menus should be placed above the fold. Recent trends also show website menus no longer being located in sidebars, rather placing it towards the top above the hero image. A common icon associated with most website menus now has been nicknamed the “hamburger” with 3 small horizontal lines being contained in a square (see the example shown in the adjacent screenshot). Search engines crawl your website to identify what it’s about. One of the many places they look is at the copy on your website’s pages. Providing two to three brief paragraphs about your landscaping business is a great way to include relevant keywords on your homepage. Write for the reader but use keyword phrases when it is possible. These phrases should communicate your service categories, where you are located, and who you do work for. When reading the Introduction Copy on the HighGrove website, it’s easy for both readers and search engines to understand a little about their business, and that they provide Landscape Maintenance and Water Management services for commercial properties in the Atlanta, GA area. Landscaping websites should also clearly state their physical locations. This is very important not only for SEO purposes, but will also help visitors to contact you or determine if they are located in areas you actually service. There are 2 places this is commonly located. Our preference is to place this information in the footer of your website so your address is prominent on all web pages. Here on the Klausing Group homepage, the information for their branch offices is tucked away in the footer but still easy to find. However, some companies like to include minimal contact information at the top of their homepage. 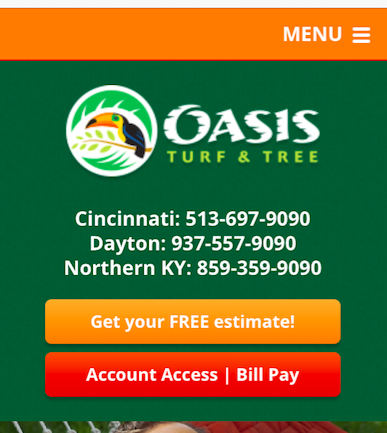 You’ll see that on the Oasis Turf & Tree homepage, the general service areas and their relative phone numbers are listed and then more specific location information is in their footer. There should be an obvious but tasteful CTA on your homepage. These CTAs can be incorporated as part of the hero image as we referenced above. However, if your hero image is more simple without a CTA, there should be other places that call your website visitors to next steps. Bottom-of-the-funnel CTAs like “Free Consultations”, or “estimate requests” can direct visitors that want to waste no time and want a price. Pacific Outdoor Living has a permanent CTA not only on their homepage, but on most of their website in the top right. Top of the funnel CTAs on a homepage will assist visitors beginning their buyer’s journey. They offer more information or resources to make an educated decision. Native Land Design directs visitors from the Hero Image to a category page that allows them to learn more about specific services. The Highgrove Partners homepage is also a great example of landscaping website ideas that incorporate multiple CTAs on one page. Here you see a link to a content offer for a free report, as well as continuing education resources for their target customer. The seven elements listed above are absolutely critical. The continuation of that list leads us to our next group of great ideas for your green industry company’s homepage. After including the essentials, try to tastefully incorporate as many of these items as you can without over-cluttering the design. Landscaping websites frequently use thumbnail images as secondary CTAs to give additional highlights to specific areas of their site. These areas usually lead a visitor to specific image galleries, or service categories. Try to keep these images limited to one or two rows of choices. You can provide even more choices on the pages that these link to. When you scroll down on the Greener by Design homepage, you’ll see two neat rows of service areas they feature. Clicking on them leads the visitor to discover more details. Likewise, landscaping websites can also use the whole width of the lower section of your homepage to link to your image galleries. On the Outback Landscape homepage, below where they incorporated three service thumbnail links, they also provide a link to their gallery. Native Land Design has unique gallery links in a single row towards the bottom of their homepage. Landscaping websites have a tendency to overdo this item. Remember that while it’s important to show you are a cut above your competitors, it’s all about the visitor before you. Pacific Pavingstone combines an image with a customer testimonial on their website's homepage. Customer Testimonials: Anonymize the customer name with just a last initial if you feel it’s best, and include the geographic area they live in. This helps with local SEO. Attach an image of the actual customer if they are okay with it. Where Your Customers are Located: Don’t give actual addresses of residential properties, but plotting them as pins on a map can show where you perform services right down the street from prospective customers. After obtaining permission, you could also include logos of local commercial properties you service and link to their website or a case study you’ve written about their project. Community and Professional Associations: Landscaping websites should also provide small association logos that link to their profile on association websites. These could be your local chamber of commerce or landscape industry associations such as NALP or ICPI websites. Awards: Another good landscaping website idea is to add current award seals for your achievements. Just don’t overdo it and make sure you keep the seals current each year. 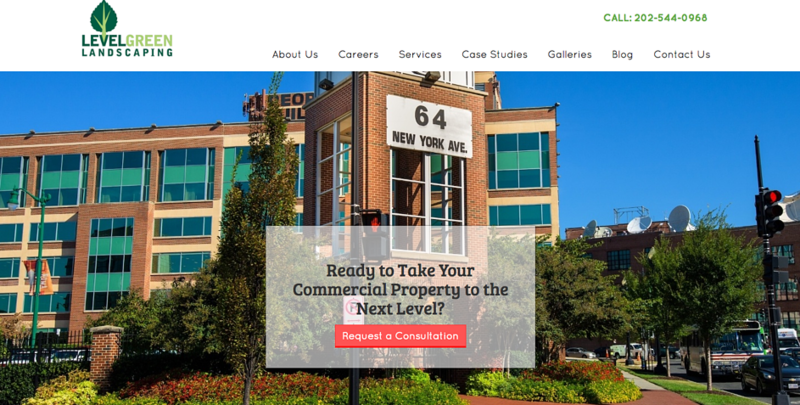 No Ka Oi Landscape Services offers social proof by displaying commercial client logos and a testimonial link on their homepage. If your landscaping website includes a lot of relevant content in blog articles, make it easy for visitors to find resources. Adding a search bar to the footer of your website is a common location for this tool on websites and our preference for a location. Here’s how Reef Tropical includes their search bar in their footer. Some landscaping companies alternately include a search bar in the top of their homepage and other website pages. With the hundreds of relevant blog posts that Neave Landscaping has to offer, it’s super easy for a visitor to find topics of particular interest in the top of their homepage. Figuring out just how to add the best landscaping website ideas on your site could leave you standing scratching your head like a frustrated homeowner looking at their unwieldy backyard. You may just not even know where to start. Our prospective clients bring us all sorts of fun challenges. Whether you need minor homepage tweaks or your site needs a complete rip-out and re-do of your landscaping website, we hope this article helps you to understand what you want out of your online brand. Laying out and implementing a homepage that works is a worthy first step. As you continue beyond that page and onto service category pages, special offers on landing pages, and powerful content marketing success through your blog, we’re happy to be a resource to you. Level Green Landscaping: Upper Marlboro and Ashton, MD and Washington D.C. Please subscribe to our blog and if you ever want to talk, please don’t hesitate to contact us. You can easily find the link on our homepage (wink).